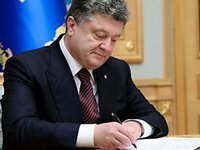 Ukrainian President Petro Poroshenko has signed into law a bill on introducing amendments to the law on the national budget for 2018, which allocates to state-owns mines an additional UAH 1.4 billion for paying down wage arrears to coal miners. "The law provides the 2018 state budget to transfer budget funds through a special fund established by Ukraine's Energy and Coal Mining Ministry according to the budget program, dubbed 'Support for the electric energy market' worth UAH 1.4 billion for state support of coalmining enterprises for partially paying down costs of finished commercial coal products by changing the name of this budget program to 'State support for coal mining enterprises to partially cover costs of finished commercial coal products,'" the president's press service said on Friday. The press service said the law would ease social tension among coal miners because funds from this budget program will be used to pay down coal miners' wage arrears. "The law also widens the pool of sources for securing funds for financing the requisite state program and includes seized funds and funds received from the sale of property confiscated by court order for committing corrupt acts or acts related to corruption," the president's press service said. As earlier reported, Ukraine's Verkhovna Rada on July 13 decided to additionally allocate UAH 1.4 billion to pay down coal miners' wage arrears. Authors of the bill first proposed allocating UAH 2.8 billion, but the amount was more than halved. Authors of the bill registered in parliament on May 16 were Mykhailo Bondar (People's Front Party faction), Viktoria Voytsitska (Samopomich Party faction), Artur Martovytsky (Opposition Bloc), Yuriy Chyzhmar and Valeria Zaruzhko (Radical Party of Oleh Liashko), Volodymyr Bandurov (People's Will group) and Oleksandr Dombrovsky (Petro Poroshenko Bloc). Parliament Speaker Andriy Parubiy signed the bill on August 2.